Yoga workshops, retreats & private classes. Combining vinyasa/ashtanga/kundalini asana with pranayama, chanting, meditation & tantric energy practices. We want you to experience yoga as a feeling that arises naturally and spontaneously out of the practises we teach at our workshops. Each experience we create uses a variety of styles and methods to allow the intention of the class to be felt. Many of our workshops align with the cycles and rhythms of our natural world, allowing us to feel into a vibration that has long been forgotten in the modern age, connecting us more deeply to our own essential nature. This training dives into the 7 energetic centres of the body known as the chakras. We learn to understand them not in theory, but rather through felt experience. Understanding them as states of consciousness that we embody. Through felt experience we workshop how they can be taught in classes with authenticity, and utilised in sessions and healings in a way that is effective and as depth. 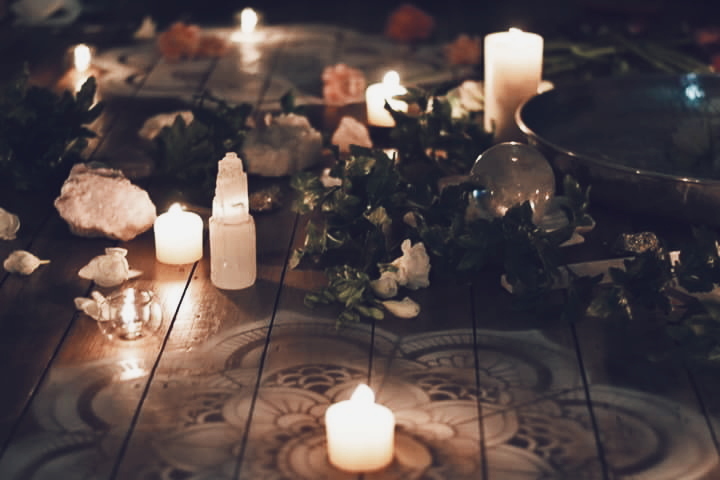 The ancient ritual of women gathering at the New Moon, to support one another and share sacred space is a practise we have been disconnected from. That yearning to find empowerment from a space of the feminine, is seen in the new movement of Women’s Circles across the world and this phenomenon of female connection is what we are celebrating in these monthly practises. The New Moon marks the beginning of a new cycle, a fresh start, time to manifest your desires, create space to support and nourish the creative element in ourselves, to refill your own cup and make time to connect with the Earth and yourself. This Full Moon we get together to explore the vibration of the full moon through the practice of specific breath exercises, mantra, yoga postures and meditations. This 2-day, 15hr training has been designed for anyone looking to facilitate Chakra practices, including meditation and yoga teachers, healers and or students with an interest to go deeper. The training focuses on how to easily incorporate the chakras into our practices and sessions with depth and feeling. We will explore the chakras through Yoga Practice, theory, journaling, teaching and discussion. Set in the most stunning location, this undiscovered luxury boutique home is in the middle of national park rainforest, atop a mountain range that overlooks the Byron Bay hinterlands and the ocean. Be prepared to embrace the wildness and majesty of this incredible location and discover your own internal life force, a vitality and vibrancy that comes from powerful yoga practises and a deep connection to nature. We will be tuning in to the energy of the natural world over the 5 days and 4 nights of our stay. This training has been designed for yoga teachers, healers and facilitators, and advanced students looking to create classes, sessions and self practices that incorporates more than just the postures. Classes that have depth, are sacred, grounded in tradition and demonstrate how all encompassing and life changing yoga really is! A retreat designed specifically to nurture and hold women in sacred space, set in beautiful rustic luxury in the middle of the Byron Bay Hinterlands. Over 5 days we connect to the rhythms of the natural world, the rainforest, the stars and the ocean. We learn ancient Shakti yoga practices- derived from the Tantras. There are so few opportunities for us in the West to do this- yet Eastern yogic practices are filled with techniques and mantras that connect us to sending out and receiving healing and also to honour, grieve and celebrate the lives of those who have past. This Month marks not only the Full Moon but also the Autumn Equinox. This poignant moment on the celestial calendar marks the astrological end of the heat and vibrancy of Summer, and an opening towards a time of shedding and change. This is a moment where we pause as we shift into a new cycle of energy with our year, doing so with the support of the Airy and balancing Full Moon in LIBRA. Through a soulful yoga practice of feminine flows, fierce breathwork and tantric meditations, we celebrate the Divine Feminine within us and the world around us. Be prepared to shift, lift and flow, to activate your own Shakti power. This Full Moon we get together to explore the vibration of the full moon through the practice of specific breath exercises, mantra, yoga postures and meditations. We will also be collaborating with Inner Soul Sounds and going on an incredible sound journey. Afterwards we invite you to stay for tea and chats. As part of the Soul Star festival this year, Sian will be leading a mini Full Moon practise. This is a special opportunity to experience the vibration of the Full Moon in a concise introduction. This community practice invites everyone to join in for a fun and heartfelt night of chanting and kirtan. Sian Pascale together with Jamie Strathairn of Yoga 8 and Mark Cedro of Inner Soul Sounds, will be opening up the practice of mantra, music, and sacred sounds to create a space of loving connection and joyfulness to all of our students. A free community gathering about Connection: to ourselves, to each other, and also to the land. The Wild Outdoor Full Moon - Yoga Practice. Come join us as we head for a Summer Special at a private farm in Whittlesea for a special evening outdoor Full Moon Yoga Practice under the Full Moon in LEO and connect our bodies and hearts to the frequency of the cosmos. Exact address to be confirmed for those who have booked. Full Moons are powerful and help you to see what is coming to fruition – in your thoughts, wishes, health, energy, core needs, as well as in your love relationships, soul desires and deepest success cravings. A self honouring gift this Christmas Day. Connect with Mother India as Sian guides a peaceful meditation live from Varanasi and the Ganges. During this 40 minute class we will be moving through a relaxing meditation using gentle breathing techniques, visualisations and affirmations to connect you to a state of love that radiates from the very core of your being. Our bodies are created with an innate intelligence, an inner guidance system that is constantly in communication with us. An inner knowing that we can feel in our gut, our hearts and our bodies. Luminous Movement is a workshop that brings us back into deep connection with our body through meditative, guided, movement practices. Using yoga flows and dance, we will allow our bodies to reconnect with this internal wisdom and intuitive way of being. This Full Moon we get together to explore the vibration of the full moon through the practice of specific breath exercises, mantra, yoga postures and meditations. We will also be collaborating with Inner Soul Sounds and going on an incredible sound journey. Afterwards we invite you to stay for tea, chats and also a night of dancing and fun! This training has been designed for yoga teachers, healers and facilitators, and advanced students looking to create sessions and self practice that incorporates more than just the postures. Classes that have depth, are sacred, grounded in tradition and demonstrate how all encompassing and life changing yoga really is! In collaboration with Ilia Renon, this mini weekend Urban Retreat will be focusing on self love, self care and connecting to your sacred feminine. In this day and a half you will discover the rituals and self care basics that will bring healing possibilities for those on this path. It is a special and sacred time to explore the different facets of the Divine Feminine Energy: creativity, gentleness, strength, sensuality, power, generosity. As part of this we discover the creative power of Shakti, that lies within all of us. In this yoga workshop we will explore a yoga practice that delves into a way of teaching and practising yoga that is sacred, grounded in tradition and demonstrates how all encompassing and life changing yoga really is! Bring a parent, grandparent, aunt or uncle to an inter-generational yoga class led by Sian Pascale. Choosing between a mat or a chair, you will be lead through a series of mindful stretches, postures and meditations to suit all types of bodies and ages. Full Moons are powerful and help you to see what is coming to fruition – in your thoughts, wishes, health, energy, core needs, as well as in your love relationships, soul desires and deepest success cravings. The Light Collective Full Moon practises allow you to dive deep- check in on the life you are creating for yourself and the affects of your intentions and how they are manifesting creatively. Together we explore with the vibration of the full moon and understand how it's astrological position may be affecting our lives. Through the practise of specific breath exercises, mantra, yoga postures and meditations we align and attune ourselves to this energy, tapping into the more subtle aspects of our minds, bodies and our yoga practise. Much more than a standard yoga class you can expect to shift energy, create new openings and be part of a group of conscious individuals ready to connect with themselves and each other in a grounded and authentic way. You’re welcome to stay after for chai and chats. Chanting has been used in many cultures for thousands of years to uplift the spirit and to stimulate energy flow. When a group chant together the collective energy of that group is so powerful, it supports deep states of meditation. Join us for a beautiful evening of chanting meditation with Sian Pascale from The Light Collective, where together we will use the sound vibrations to realign the energy in our bodies, enabling a shift of vital life force and a place for healing to occur. You do not need to have a “good” voice, or have ever chanted before. There are limited places available. This 2-day/15hr training has been designed for meditation and yoga YTT200 teachers, facilitators and healers. The training will be focusing on the 7 chakras of the body and how we can effectively utilise them in our practices and sessions. We will explore the chakras through practice, theory, journaling, teaching and discussion. We want you to feel and experience these energetic practices so you can teach them from the heart. This Continuing Professional Development (CPD) workshop, will explore how to incorporate Mantra, Pranayama and Meditation into your teaching practice. The session will coach you to artfully bring these deeper elements to your teaching while building your confidence to find your voice as a soulful teacher. Learn how to create well-rounded, holistic classes grounded in tradition. This training has been designed for both meditation and yoga teachers who have completed their YTT200 but are looking to create classes that incorporate more than just the postures. Classes that have depth, are sacred, grounded in tradition and demonstrate how all encompassing and life changing yoga really is!